Sometimes you do work because you want to. Sometimes you do work because it makes you feel like you have done something positive. Sometimes you do work because it’s a way to contribute. In other words, not all design work needs to be for a large paycheck. 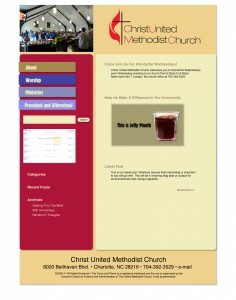 Which brings me to the Christ United Methodist Church of Charlotte website! Several years ago, our minister, Rev. Jim Humphries, came to me and asked if I could update the church website. The website we had was old, rarely updated—it had pictures of people who were no longer members and some who were no longer alive!—and it definitely needed some help. I believe it had been built in Frontpage. So I volunteered to help. The first redesign we came up with was a static site which I designed and built in Dreamweaver. I based it on a brochure design which I had made for the church awhile back. The new site was an improvement from the original, but it was still very difficult to update. Plus, another designer at the church had some great ideas on how he wanted to organize it. Unfortunately, we were long on ideas but short on execution! I had put some dummy text in the new pages and the pages never got updated. Essentially, we were no better off than when we had begun. As it turned out, I had been learning about dynamic sites on Lynda.com. I had even built a few websites in WordPress for commercial clients. This was the solution our church needed, too. We needed a site which was easy to update by different members of the church staff (in addition to me) so that the burden of updating the site didn’t fall on one person. Now comes the fun part, picking out a theme and designing a site! WordPress does offer the option of starting a theme from scratch, but this is far more work than is really necessary considering the number of really nice themes out there. However, you also have to take into consideration what functionality you need and, let’s get real here, most of the truly nice themes are premium themes. In other words, you have to pay for them. Admittedly, some are very reasonably priced, but this project is volunteer work so no need to spend money when you don’t absolutely have to. As it turned out, I chose the default (at the time) TwentyTen theme and built a child theme on top of it. By doing it this way, our church can get all the bells and whistles that the developers at WordPress.org can come up with and we can keep the site updated without worrying about crashes which can sometimes happen with themes which aren’t developed well. 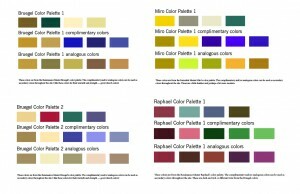 I started the design process with color palettes. I came up with several, (Bruegel, Miro, and Raphael from Jim Krause’s book, Color Index), made swatches of them, then ran them by the minister and a few select staff members. We were looking for something that was both warm and inviting but also showed strength. We ended up choosing Bruegel Color Palette Number 2. Now we needed a logo. The church had one, but it was rather dated (the type was set in a black letter font), so I came up with a few ideas that were more contemporary and matched our color palette. The minister definitely wanted us to incorporate the United Methodist Cross and Flame. We ended up choosing the version you see in the masthead due to its clean design and legibility. 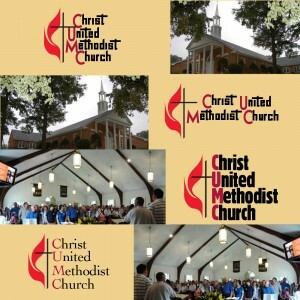 The letters C, U, M, and C are set in capitals and the red color since these are the initials our church usually goes by (CUMC). We have preschool and after school programs which, although affiliated with our church, are not part of the regular ministry, so the preschool administrator asked if there were a way to differentiate these programs from the rest of the site. Since I based the child theme on the TwentyTen theme, we were able to use a Featured Image for a header. The preschool section of the site has its own header with smiling children instead of a congregation singing with the praise band! After getting the site started, I gave the staff roles so they could edit content. I trained them in how to use WordPress and we now have a very active website. Frankly, I was surprised at the ideas everyone came up with to improve the site. We added Flickr pages, audio files of Sunday sermons so that folks who missed services could listen at their leisure, newsletters for the Community Garden, and of course, our blog—Church Chat. We have links to Google calendars, a Google map, and to our various church Facebook pages. Our pastor has composed two series—Walking Thru the Bible and Forty Days of Prayer—which still bring in lots of traffic from all over the world. Not bad for a small church in northwest Charlotte, NC! The church is pleased with the website. We get visitors from all over the globe. A lady from New Zealand even left a comment on one of our posts! 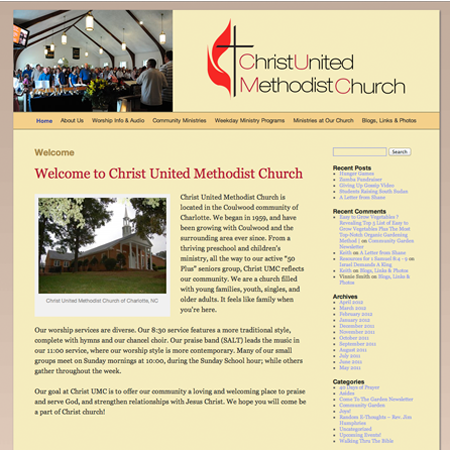 Although the world traffic is great, the idea is to make Christ United Methodist Church easy to discover for people in the immediate area. The CUMC website does the trick! Our Google Analytics page shows that people searching for churches in our neck of the woods have found our church under a myriad of local search terms. Naturally, one of the reasons is because I have optimized the site for local search. Also, some of the most searched for keywords are for preschool and after school programs. These programs in particular have benefited from the WordPress conversion. It’s nice to see a vibrant church growing, providing needed services, and spreading good news throughout the local area and beyond! The take away here for designers is that you don’t always need to design for the big payoff. Sometimes you design because it is the right thing to do. 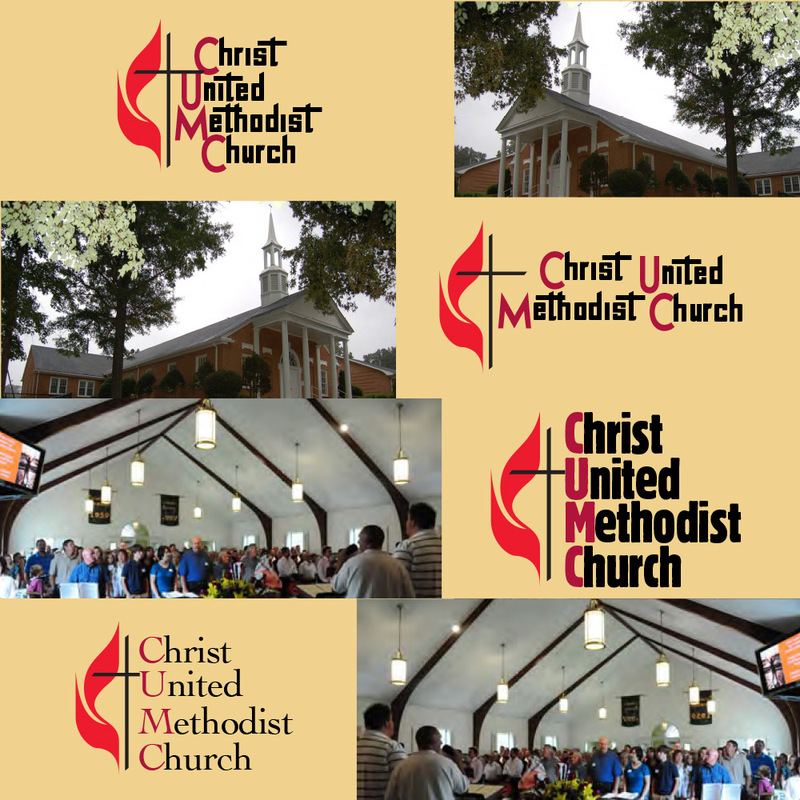 Koger Creative would like to thank the staff and congregation of Christ United Methodist Church for their diligence in maintaining the site and for providing a wonderful ministry. Special thanks go out to Danny Mitchem, graphic designer and Youth Director; George Servian and Brenda Beatty, photographers; Mark Sadowski, IT services; Ellen Thompson, children’s ministry; and Rev. Jim Humphries for his wonderful content and leadership.